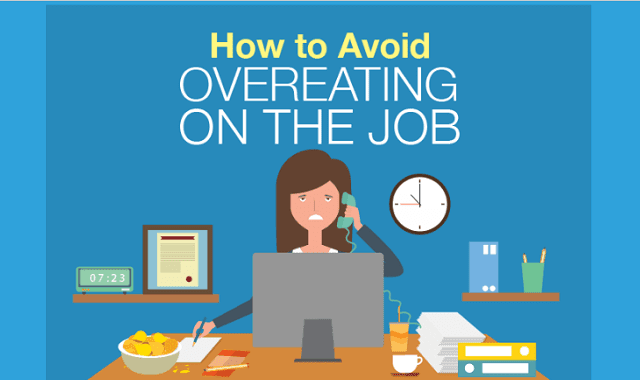 How To Avoid Overeating On The Job #Infographic ~ Visualistan '+g+"
Let’s cut to the chase: If you’re truly hungry while on the job, then by all means, eat. But if you’re frustrated by the habit of noshing at work even when you aren’t hungry (or if you’re eating past the point at which you feel full), then keep reading. You’re not alone and there are plenty of strategies you can implement to help break the habit of overeating at work. Overeating on the job can take two forms: eating when you aren’t hungry or eating more than you’re actually hungry for when you eat. Whatever form it takes, overeating generally comes from one, or a combination, of several factors: stress, burnout, or proximity (in other words, we’re more likely to reach for a handful of chocolates if they’re sitting within arm’s reach).